YES, I have reviewed my order for any errors. The Super Star Medal is perfect for a Super Star in any sport or accomplishment. This zinc alloy medal is 2.5" in diameter and has a classic style to it that depicts an exciting sculptured cutout within a star border. A laser engravable disc can be put on the smooth recessed back of the medallion. Each medal includes a Free Neckband of your choice. Add a 2" full-color poly domed insert on the back of each medal. Elegant fonts that are perfect for any type of text or occasion. Classic style fonts that are perfect for monograms. These fonts are great for mulitple lines of text. * The fonts available for these previews are the fonts available for customizing this item. * Font Previews may not display correctly on browsers other than Chrome. * Most item font choices are based on Microsoft Office font names. * If you have a font that you would like to use that is not listed, please make a note of the font name in the Add Info box, during customization, and we will see if we have that one. Just the right neckband for your medal is really what sets the look of your recognition award. We have three different styles to choose from and a wide variety of color choices and combinations. Pick out the neckband that you wish to go with your medal, and then select that item number and color(s) when purchasing your medal. 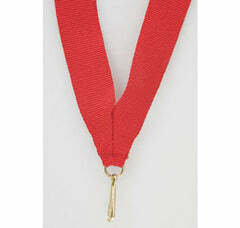 Our broad selection of these stock Wide Neckbands, sized 1.38” x 32”, takes medal presentation to the next level. Choose from an array of colors, events, and sizes to pair perfectly with your medal. All neckbands have a "V" shape and include a quick clip medal fastener. Our broad selection of these stock Thin Neckbands, sized .88” x 32”, will add an extra flair to your event. Choose from an array of colors, events, and sizes to pair perfectly with your medal. All neckbands have a "V" shape and include a quick clip medal fastener. These Color Image Neckbands use the sublimation printing method that will add flare to your medal with a high-quality image printed directly on the neckband. These gems are sized .88” x 32” and you can choose from an array of images, styles, and events to pair perfectly with your medal. All neckbands have a "V" shape and include a quick clip medal fastener.